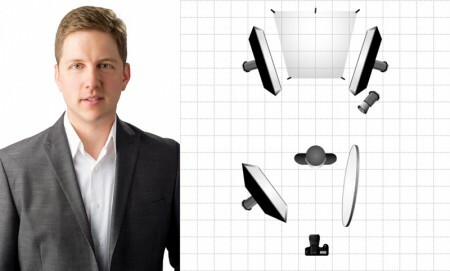 Shooting many business headshots and portraits, I’m constantly looking for a background solution that’s fast to setup, flexible to use, small and lightweight, and most importantly, can replace the good ol’ fashioned 4ft roll of seamless. Found it! The Westcott X-Drop combines all of this into one great package. 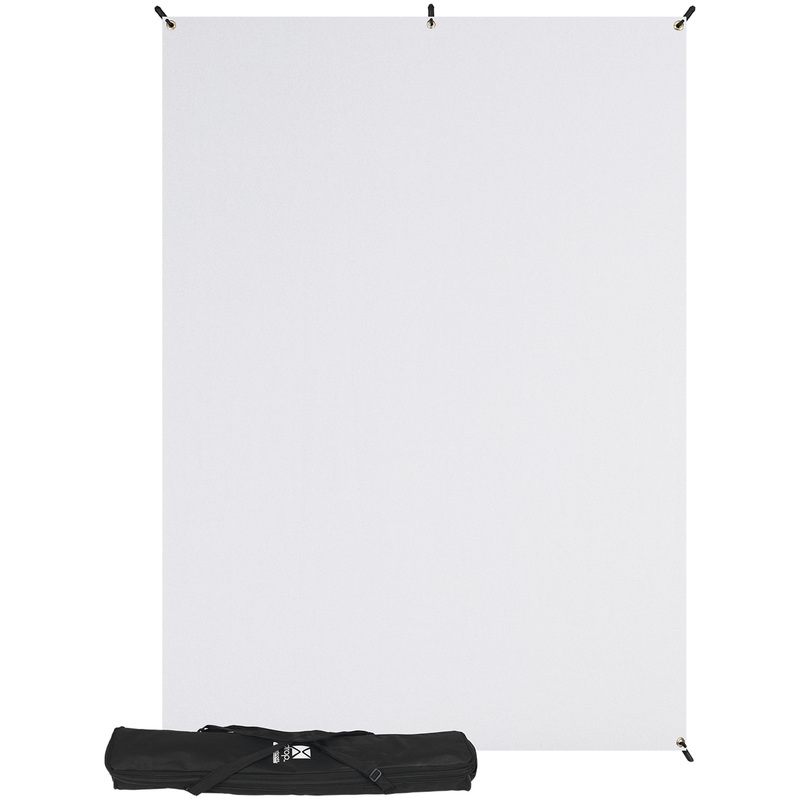 The X-Drop is an interchangeable, collapsible 5′ x 7′ backdrop that is surely the lightest, fastest setup backdrop system I’ve seen. I’ve used the X-Drop on many professional shoots already and I’ve found it to be a huge time saver. 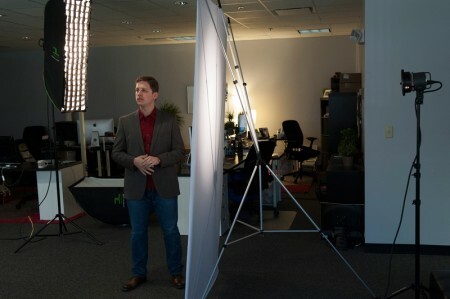 Here’s a shoot I recently did at the LensProToGo offices with my brother, Jeff. My goal was to test the versatility of the white X-Drop and create 3 different looks. The setup couldn’t be easier. The entire assembly fits in a travel case (included) that’s no bigger than most collapsed tripods. The backdrop itself is a machine washable fabric that can be folded up and stored in the small pouch. The aluminum frame is in 4 separate pieces: the legs, and 3 posts. Everything expands with ease and fits together well. 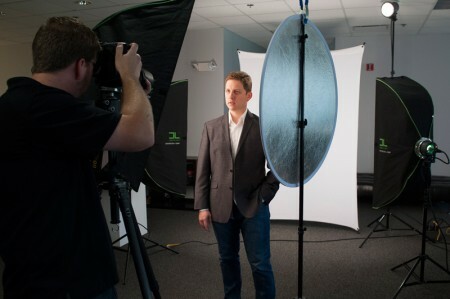 The White background is one of my standard setups that many of the Boston-based companies that hire me like to have when it comes to business headshots for their teams. Normally, I’d have to bring extra stands, a crossbar, a roll of white seamless, tons of extra clamps, etc. With the X-Drop, all I need is the travel case and about 2 minutes of setup time. I light it exactly how I would seamless paper–in this case, 2 strip lights backed away enough to cover the entire background. What I’ve discovered to be a great bonus feature of the X-Drop is that it’s much less reflective than paper. This in turn prevents much if not all light from spilling back onto the subject or into the lens. Some companies don’t always jump on the ‘high key white background’ bandwagon and want something mid to lower key for a slightly more dramatic look. The good news is that I was still able to use the white fabric but simply lit it differently. I used a strip light on the ground slightly pointing up to create a gradient from light to dark going from bottom to top. I chose a gridded strip light for Jeff to get more shape on his face and to have minimal hot spots overall. The grid is also helpful in keeping light off the background so the gradient remains nice and smooth. 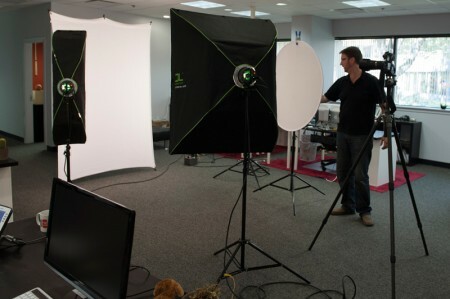 In my quest for 3 uses of the X-Drop–particularly with the white fabric–I was surprised to discover that it does quite well as a light modifier. For this shot, I fired a gridded bare bulb through the X-Drop at Jeff. 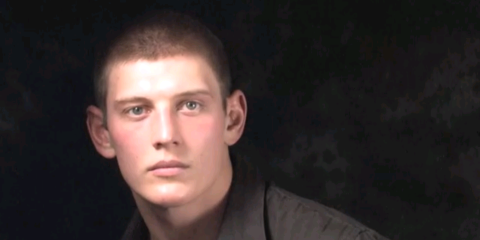 The light is about 5-6 feet from the backdrop, and the backdrop is about 2 feet from Jeff. 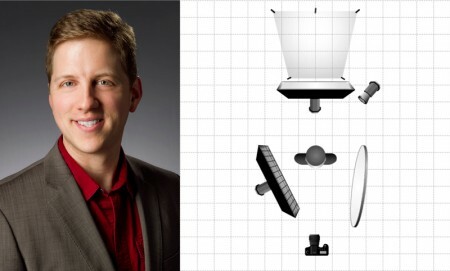 What I was trying to achieve with this setup was to create as natural looking light as possible–like window light. 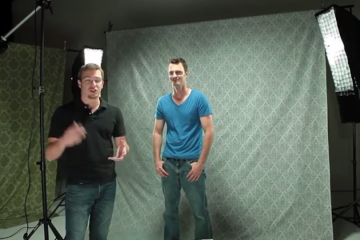 There’s no fill but there is a soft gridded strip light as a kicker coming from behind Jeff from camera left. I found that this setup gave me great control to balance a room’s ambient light and create some killer environmental portraits. 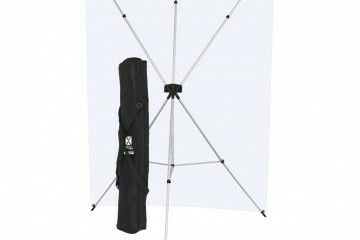 The Westcott X-Drop is the easiest, lightest, most versatile collapsible backdrop system I’ve seen. It’s wider than seamless paper and also less reflective–both huge pluses in my book. The white color shoots a little on the cool side, which is incredibly easy to neutralize in post. The back leg of the tripod sticks out a bit far, making it tough to put up against a wall, but I simply collapse that leg and lean it up against the wall if space is tight. This system has almost completely replaced my 4ft seamless setup. 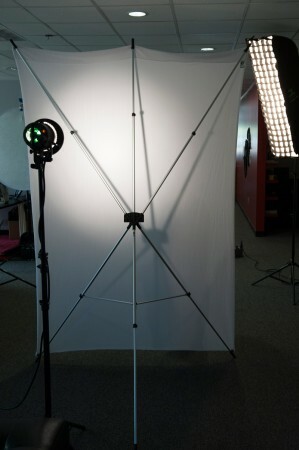 Can’t wait to try out the black fabric for really low key and the green for video chroma keying!